The Diamond Dollars Case Competition winners were announced Friday, March 8 during the 2013 SABR Analytics Conference at the Sheraton Phoenix Downtown in Phoenix, Arizona. A team of students from Pepperdine University's Graziadio School of Business and Management delivered the top presentation in the Graduate and Professional School Competition, while a team from New York University's Tisch School won top honors in the Undergraduate School Competition. The Pepperdine team was comprised of Michael Alexander, Joseph Franzi, David Meals, Daniel Paret and Ramu Raju. The NYU team was comprised of Raef Cogan, Hunter Gilbertson, James Goldstein and Michael Rappaport. This year's "case," developed by SABR President Vince Gennaro, was called "The Mike Trout Dillemma." Students were asked to advise Los Angeles Angels of Anaheim GM Jerry Dipoto on their strategy for maximizing the value of their prized asset, Mike Trout. "These 11 schools processed the information and came up with some very innovative solutions," Gennaro said. "They did some fascinating work. I think everyone who participated did so at a high level, which made it difficult for the judges to choose a winner." Dipoto was a featured speaker on Thursday night at the SABR Analytics Conference. 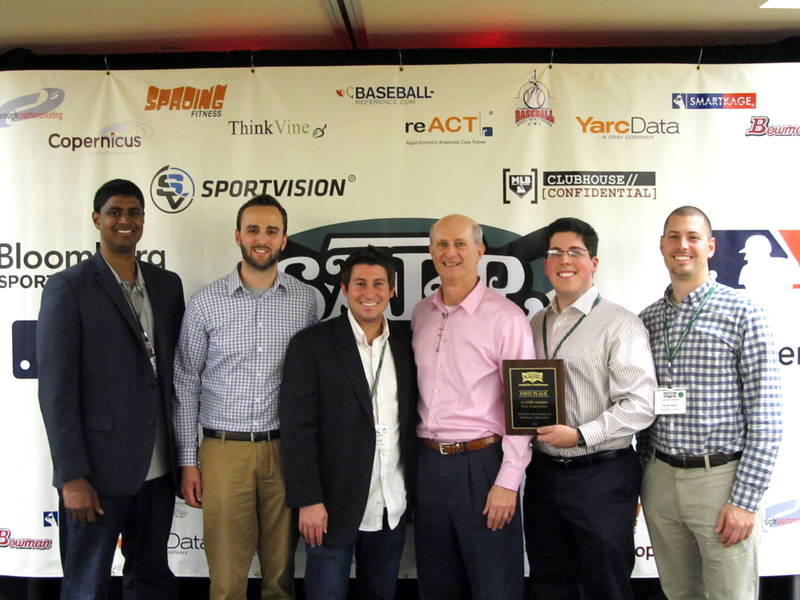 The runner-up in the graduate and professional school division was the University of Chicago's Booth School of Business, which won the Case Competition in 2012 at the inaugural SABR Analytics Conference. The runner-up in the undergraduate division was Cornell University, captained by Hudson Belinsky. In the Diamond Dollars Case Competition, undergraduate, graduate and professional school students from colleges and universities across the country compete against each other by preparing an analysis and presentation of a baseball operations decision — the type of decision a team’s GM and his staff is faced with over the course of a season. The cases are developed by SABR President Vince Gennaro, author of Diamond Dollars: The Economics of Winning in Baseball, and consultant to MLB teams. The Diamond Dollars Case Competition is the first national competition to be based solely on baseball operations issues. This year's judges were Christopher Correa (St. Louis Cardinals), Matt Obernauer (Colorado Rockies), Dave Studemnund (The Hardball Times) in the graduate and professional school division and Victor Wang (Cleveland Indians), Matt Vinnola (Texas Rangers) and Ben Jedlovec (Baseball Info Solutions) in the undergraduate division. Participating schools in the graduate and professional school division were: George Washington University Graduate Business School; Elon University-Love School of Business; Indiana University-McKinney School of Law; and Columbia University-Graduate Sports Management. St. John Fisher College and two teams from Tufts University participated in the undergraduate division. 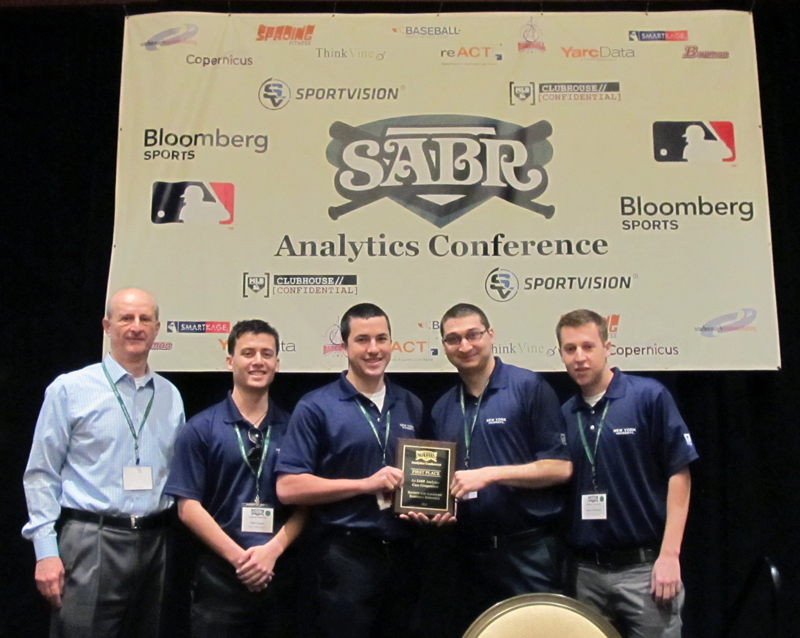 For more coverage of the 2013 SABR Analytics Conference, visit SABR.org/analytics/2013.